We, at Peter’s Pressure Washing, specialize in travertine sealing services. As an independent family-owned business located in the Tampa Bay region, our work speaks for itself. Over the years, we have proudly served many residential and commercial projects with our meticulous approach. We use high-quality and natural-looking penetrating sealer to prevent staining for many years. Travertine is a natural stone that is widely used to beautify outdoor spaces like pathways, pool areas, patios, and driveways. Yet, it requires a lot of maintenance to preserve its aesthetic appeal. A high-end stone such as travertine deserves no less than a high-end sealer to protect and enhance its natural beauty. When you choose Peter’s Pressure Washing to protect and enhance your travertine, you will be receiving not only the best product available but a high-end expert application from a pressure washing company that values quality and customer service. Choosing the right sealer for travertine tiles is essential to get keep that glossy look and for its longevity. Seal ‘n Lock is one of the few sealers that can be recommended for a stone such as travertine. 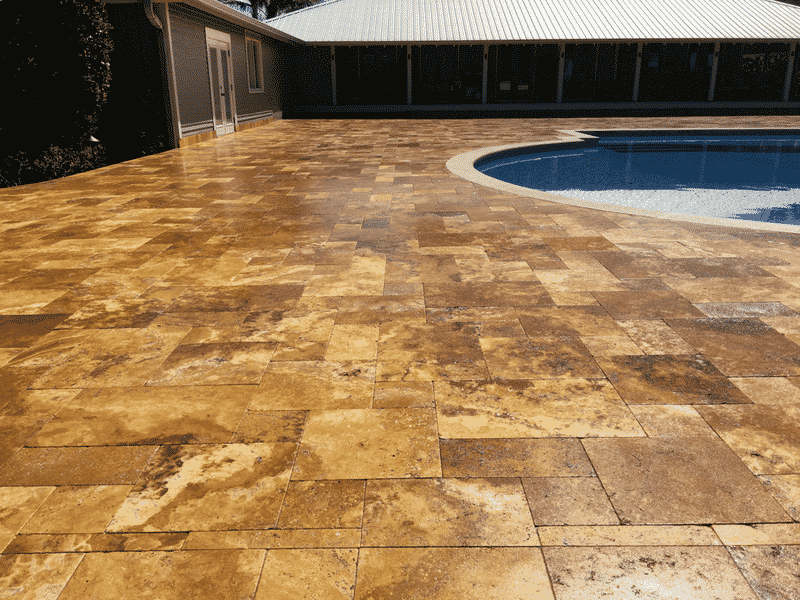 Since travertine is less porous than pavers the mechanical bonding properties of the sealer are even more heavily relied upon when it comes the adhesion of the sealer to the stone. Many other sealers will quickly fail when applied to travertine; however, Seal n Lock will not. Sealing travertine requires the touch of a skilled professional since there are many nuances of application that are not present when sealing pavers. At Peter’s Pressure Washing we seal travertine on a regular basis and comfortable and confident with the process and application. We also offer an anti-skid “shark grip” application to reduce slipperiness if so desired. I am extremely happy with the results. I never thought I’d see my porch/walkway get this clean. It looks like it did 15yrs ago when I bought my home. Thank you! 2 thumbs up and I’d give more stars if I could! Travertine stones are susceptible to damage caused by staining, fading of colors or even weather corrosion. Using a sub-standard sealer are not recommended as they form a thin film which wears off soon, causing an irreversible damage later. Additionally, sealers are effective when you live in an area which has low temperatures because of the freezing and thawing of outdoor tiles. Water gets absorbed into its porous material dissolving the salt within the stone and weakening it. In the end, usage of a sealer only makes your travertine increase its durability and longevity. Sealing travertine done by our team of skilled professionals is like no other. We have a methodical approach to the nuances of its application. As we seal travertine on a regular basis we are comfortable and confident with its process and application. We also offer an anti-skid “shark grip” application to reduce slipperiness if so desired. Look at the reviews from our many satisfied customers! Get in touch with one of our representatives today!